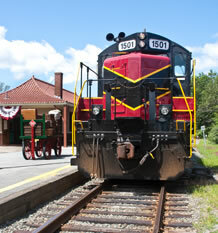 Coastal Excursion Train Rides - www.capetrain.com for West Barnstable scheduled departures. All tickets available at West Barnstable Train Station & Museum. See our Calendar for more details. All Aboard! The Cape Cod Chapter of the National Railway Historical Society is a non-profit 501c3 organization dedicated to the promotion of and preservation of railroad transportation history, with special emphasis on Cape Cod railroading. The Chapter was chartered in 1986, although the Cape Cod group can trace its history back to the early 1960s. Museum is open May-October Saturdays 10:00 a.m. to 3:00 p.m. The Cape Cod Chapter of the NRHS supports railroad historians, collectors and enthusiasts on Cape Cod. When you visit the West Barnstable Railway Station and Museum you step back in time to a place that was the center of village activity in West Barnstable in 1911. The New York New Haven & Hartford Railroad Company served freight and passenger service on the Cape and constructed a new concrete railway station on the site of the original wooden station. The cost of building the new station was $18,000 and followed the same style pattern that the New Haven R.R. used in constructing the current Buzzards Bay Station and the long gone Sagamore Station. In 2001 the Cape Cod Chapter of NRHS became the custodians of the station. The building was boarded up and in need of much repair. The Chapter is working diligently to bring the station back to its original splendor. Our building contains most of the original woodwork and facilities of the original station which opened for business July, 1911. It is painted in the original building colors; five different colors on the exterior and two on the inside. 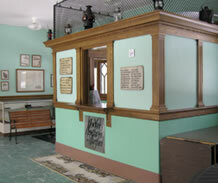 The original coal stove (which preceded the steam radiator system installed in 1911) has come back to the station. The West Barnstable Station contains working railroad tools and equipment, lanterns, switchstands, a baggage cart, and a small motor car (often referred to as a speeder which was used primarily by track maintenance workers). Some of the original telecommunications equipment remains in the ticket office. We are proud of our new multi-media library-available for all train lovers. VISITORS ARE ALWAYS WELCOME! VOLUNTEERS NEEDED! JOIN AND BECOME A MEMBER with FAMILIES and STUDENTS TOO! Preserving the railroad history of Cape Cod since 1986.